It needs a special type of oil filter and that makes an oil change a lot more expensive. My complaints/dislikes about my vehicle would be primarily that the visor does not come down far enough to block sun. (The car I had before this one had a really good, well made visor & went down further.). I am short, so the majority of the time the visor doesn't help. I think this is the worse visor I have ever had in a car. The other complaint would be that I cannot adjust the chair up higher. (Again, I am short. The car I had previously did adjust). Another real bad thing is that I had a surprise added cost for an oil change, since it requires a special type of filter thing. I was not happy about that. That was a big financial hardship for me. I wish I had a car key beeper thing too. What I like, that it gets better mileage than the car I had before this one. It doesn't get wonderful mileage, but it is better than the previous car. I also like that I can go camping & the trunk is adequate for a tent etc, a bit cramped, but not superbad. I also like how it drives. It is an ok color too. This is the first car I have had that pops the trunk I think. That is nice at times. It has been mostly dependable over the vast amount of time that I have owned it. My car has some nice features like a very roomy backseat, a partially foldable backseat, a built in dvd player, built in xm radio, and I like the hatchback feature of the trunk. The car has served me well over the past 13 years and was my first vehicle as a teenager. However, over the past few years especially, it has started to have problems that are forcing me to consider a trade in. The transmission shift has partially gone out and needed to be replaced, one of the pull across shades in the back seat moonroof no longer pulls in and out but just hangs, the dvd player skips and only works sometimes, the cd player in the front ate a cd years ago and has not worked since, and most recently (and annoyingly) the wiring to the front passenger lights keeps overheating and has melted the internal plastic of the light casing, plus the light seating keeps bumping loose to the point where it has to be adjusted by hand and with stools most mornings before leaving to make sure it turns on. 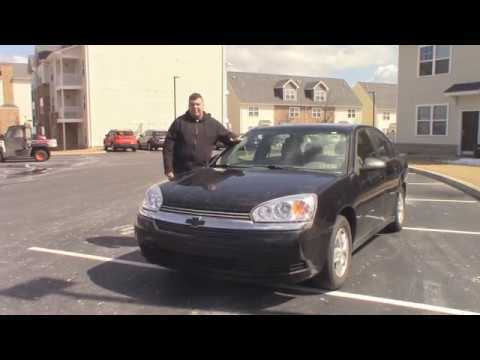 2004 Chevy Malibu: a reliable find! My 2004 Chevy Malibu has been a great car to get around in. I am a second year college student, so I wasn't too picky when it came to the type of car I drove. All I wanted was a car that ran nicely and didn't break down on the way from point A to point B. Disclaimer: my vehicle was a rebuild. It was totaled in an accident and then salvaged and rebuilt. Not all of the parts in my vehicle are the originals. My car has leather seats that have held up really well, but the door detailing and pleather along all doors has started to fall off. I am not sure if that has to do with the extreme change of temperature here in Wisconsin or the glue getting old. I have had to replace the turn signal light bulbs quite often, but that may be an problem exclusive to my vehicle. Other than its small quirks, this four door car has traveled far and gotten me everywhere I needed to be in a safe manner. What a great starter car! GM will notify owners, and dealers will attach the wiring harness to the BCM with a spacer, apply dielectric lubricant to both the BCM and harness connector and the BAS and harness connector, and will relearn the brake pedal home position, free of charge. The manufacturer has not yet provided a notification schedule. Owners may contact General Motors customer service at 1-800-222-1020 (Chevrolet), 1-800-762-2737 (Pontiac), 1-800-553-6000 (Saturn). GM's number for this recall is 13036. SOME OF THESE PASSENGER VEHICLES HAVE AN ELECTRONIC CONTROL UNIT (ECU) THAT MAY CALCULATE A HIGHER THAN ACTUAL VEHICLE SPEED BECAUSE OF AN ERRATIC REAR-WHEEL SPEED SENSOR SIGNAL, AND CAUSE ABS ACTIVATION WHERE IT IS NOT NEEDED OR NEEDED ABS ACTIVATION TO BE EXTENDED DURING BRAKING AS THE VEHICLE SPEED DROPS TO ABOUT 3 MPH. UNEXPECTED ABS ACTIVIATION COULD INCREASE STOPPING DISTANCE UP TO ABOUT 11 FEET DPENDING ON THE GRADE OF THE ROAD, INCREASING THE RISK OF A CRASH. DEALERS WILL REPROGRAM THE ABS CONTROLLER. OWNER NOTIFICATION BEGAN ON JUNE 16, 2004. OWNERS SHOULD CONTACT CHEVROLET AT 1-800-630-2438. ON CERTAIN PASSENGER VEHICLES, ANALYSIS OF AN A SIDE IMPACT CRASH TEST CONDUCTED BY THE NHTSA'S NEW CAR ASSESSMENT PROGRAM (NCAP) INDICATED THAT THE OUTBOARD ANCHORAGE OF THE DRIVER'S SEAT BELT COULD DISCONNECT BECAUSE OF CONTACT BETWEEN THE SEAT TRIM AND THE ANCHORAGE CONNECTOR WHEN THE SEAT WAS ADJUSTED TO ITS LOWEST POSITION. IF THIS OCCURRED IN A CRASH, THE DRIVER COULD RECEIVE GREATER INJURIES. DEALERS WILL INSERT A RETAINER ON BOTH THE DRIVER'S AND PASSENGER'S BELT ANCHORAGES. OWNER NOTIFICATION BEGAN ON JUNE 16, 2004. OWNERS SHOULD CONTACT CHEVROLET AT 1-800-630-2438. CERTAIN PASSENGER VEHICLES FAIL TO COMPLY WITH THE REQUIREMENTS OF FEDERAL MOTOR VEHICLE SAFETY STANDARD (FMVSS) NO. 208, OCCUPANT CRASH PROTECTION. SOME OF THESE VEHICLES THAT WERE NOT EQUIPPED WITH AN ADVANCED OCCUPANT RESTRAINT SYSTEM (AORS) HAVE DRIVER AND PASSENGER SIDE SUN VISORS WITH AORS LABELS. THE AORS LABELS DO NOT INCLUDE STATEMENTS AND THE ILLUSTRATION REQUIRED BY FMVSS NO. 208 FOR VEHICLES WITHOUT AORS. OWNERS WILL BE SENT REPLACEMENT LABELS WITH INSTRUCTIONS ON HOW TO INSTALL THEM. OWNER NOTIFICATION BEGAN ON APRIL 21, 2004. OWNERS SHOULD CONTACT CHEVROLET AT 1-800-630-2438.